Now consider the Proceeds of Crime Act. Blair conspired in and executed an unprovoked war of aggression against a defenceless country, of a kind the Nuremberg judges in 1946 described as the ‘paramount war crime’. This has caused, according to scholarly studies, the deaths of more than a million people, a figure that exceeds the Fordham University estimate of deaths in the Rwandan genocide. In addition, four million Iraqis have been forced to flee their homes and a majority of children have descended into malnutrition and trauma. Cancer rates near the cities of Fallujah, Najaf and Basra (the latter ‘liberated’ by the British) are now higher than those at Hiroshima. ‘UK forces used about 1.9 metric tonnes of depleted uranium ammunition in the Iraq war in 2003,’ the Defence Secretary, Liam Fox, told parliament on 22 July. A range of toxic ‘anti-personnel’ weapons, such as cluster bombs, was employed by British and US forces. In May 1999 someone set off nail bombs in various places in London, and Tony Blair went on record as denouncing this as “barbaric”. And at the same time there were news reports that Father Milivoje Ciric, who left a special service in his church to help victims of a Nato bombing, has been decapitated by a follow-up blast. This is a typical terrorist tactic — set off a bomb, and when a crowd gathers to help the injured, kill even more people with a second blast. You can read about the incident here, and see pictures here. The nail bombs, of course, were barbaric. They were designed to cause the maximum injuries. But Natos cluster bombs were designed to do exactly the same thing, only far more efficiently. Look at the pictures, and see Tony Blair’s handiwork. Yes, it is truly barbaric. When the bomb went off in Old Compton Street, Mr Blair described it as a barbaric act. When cluster bombs go off in Serbian marketplaces, cutting children into pieces, we are told that such an act is being taken on behalf of ‘civilisation against barbarism’. Mr Blair is clearly having a wonderful time. But if Britain remains America’s poodle, she is now a vicious and demented poodle. The Nato action is in breach of its own charter and outside all recognised parameters of international law. Nato is destroying the infrastructure of a sovereign state, murdering hundreds of civilians, creating widespread misery and desolation, and doing immeasurable damage to the environment. Barbaric? Yes. But as the prophet Nathan said to King David, “Thou art the man.” (I Sam 12). But there is one crucial difference, for it is recorded that King David repented, but Tony Blair has not. Yesterday Yugoslavia, tomorrow the world! By successfully demonifying the Serbs, and transferring the guilt of its Nazi past to them, Germany has succeeded in perpetuating the past rather than burying it. The US and Germany, which fuelled the Wars of the Yugoslav succession in the 1990s, are planning to fan the embers to a flame again. LJUBLJANA, Slovenia – The United States and Germany have agreed to recognize Kosovo and get the rest of Europe to follow suit after the province declares independence following the Serbian elections next month, according to senior European Union diplomats close to negotiations over the future of Kosovo. In a recent conversation about the future of Kosovo, EU officials said President Bush and Chancellor Angela Merkel of Germany had agreed it was imperative to secure the stability of the western Balkans by coordinating the recognition of Kosovo after the second round of Serbian elections planned for Feb. 3. They said Washington was aggressively pressing the EU to ensure that the recognition of Kosovo was not delayed by even a week. role in developing German public sentiment for recognition. ‘Bavarian TV’, Flora Lewis noted, ‘much weighed upon by the very conservative Bavarian government and the strong, assertive Bavarian Catholic Church which had close connections with the church in Croatia, provided the television reports for all of Germany when the war began in earnest. The coverage was very one-sided’… Germany pressured the European Union to recognise the independence of Slovenia and Croatia, and then, having secured that, pushed forward on its own to recognize them before the Union did in December 1991.
consequences in 1994 when the Pope planned visits to the three republics. Opposition by the Serbian Orthodox Church prevented his going to Belgrade, and Serb unwillingness to guarantee his security led to the cancellation of his visit to Sarajevo. He did go to Zagreb, however, where he honored Cardinal Alojzieje Stepinac, who was associated with the fascist Croatian regime in World War II that persecuted and slaughtered Serbs, Gypsies and Jews. The focus then moved to Bosnia, where John Major agreed to recognise Bosnia’s independence in return for German support for Britain’s position on the Maastricht Treaty, thus condemning Bosnia-Herzegovina to a bloody civil war. And what was the result? Far from being radicalised by the failure of the west to act, large numbers of Muslims were radicalised by western intervention in the Balkans. Their movement to Bosnia was facilitated by Washington’s support for a military gateway between the Islamic world and Bosnia, and inside Bosnia they fought with a military outfit that Washington armed. They were also inspired to take up arms against the Serbs by western media depictions of the Serbs as sub-human savages who deserved ‘punishment’. The mujahideen meted out such punishment, in the form of stabbings, beheadings and forced circumcisions, as well as ordinary warfare. Many of the mujahideen who fought in Bosnia went on to become al-Qaida operatives. They learned their trade of simplistic moral fury and brutal violence on the battlefields of Bosnia, where they were enticed and inflamed to execute holy war against the Serbs by western meddling and western media coverage. And now it’s Kosovo — deja vu all over again! Most of us have read in the newspapers and seen graphic images on television of the violence and destruction of the Wars of the Yugoslav succession, when Yugoslavia tore itself apart (often with outside assistance) during the 1990s. But even in the midst of the destruction, there were signs of hope, as some, at least, pursued more preaceful ideals. Among these is a new generation of Orthodox monks. They grew up under the communist system, indoctrinated at school with atheism, and now have turned to a life of prayer and repentance. There is much talk nowadays, especially in “emerging church” circles, about a “new monasticism”, but in the former Yugoslavia the youth have opted for a restoration of the old monasticism. 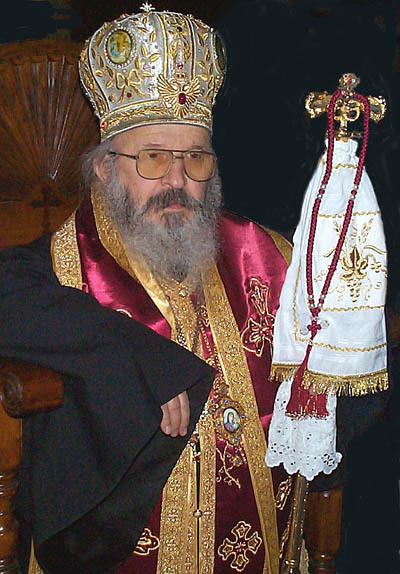 And now the man who has been at the centre of the monastic revival in Serbia, His Grace Artemije, Bishop of Raska and Prizren, will be visiting South Africa, and will speak on the topic Orthodox monasticism, and the revival of the monastic life in Serbia after communism at St Thomas’s Orthodox Church, Sunninghill Park, Gauteng on Saturday 5th May 2007 at 5:00 pm. If anyone is interested in attending, you will find more information here. Anyone who is interested in Christian monasticism, new or old, is welcome to attend. From Johannesburg, Pretoria, East Rand, West Rand, take the N1 freeway to the Rivonia Road offramp, then turn North towards Leeukop prison. About 2km from the freeway exit the road narrows, and just before it narrows there is a turn-off to the right, and almost immediately one turns to the left, then right again, and the entrance to the church parking is just round the corner. There will be a sign that says “Church Parking” at the gate. Bantustans for Europe? Should Kosovo be independent? Is Europe about to get its own independent homeland of Bapetikosweti? The Nato attack on Yugoslavia in 1999 (which was every bit as foolish as the US invasion of Iraq in 2003, lest anyone think that there is any significant difference between the two major US political parties) not only failed to solve the problems of Kosovo, it exacerbated them. One of the most dangerous and unrealistic ideas circulating today in international politics is that the Serbian province of Kosovo is a “unique” case. People in all of these areas, and many more, are following the Kosovo story very closely, especially given that most of them have suffered more violent conflicts and have waited for the solution of their problems much longer than the province of Kosovo. Given the continuous pressure on the Serbian community in Kosovo, it is easy to imagine that the independence of the province would most certainly lead to a mono-ethnic Albanian Kosovo. Serbs who left would never come back. It has been an open secret for a while now that “goodwill advisers” have been suggesting to the team of the United Nations chief negotiator for Kosovo, Martti Ahtisaari, to find a legal basis for the “uniqueness” of Kosovo in order to avoid setting a precedent that could affect other regions of the world. But Ahtisaari should avoid a “one- time solution” that gives independence to Kosovo. Breaching international law might appease Albanian separatist aspirations in Kosovo, but it would certainly open a Pandora’s box of separatist causes worldwide. There is also a longer and more detailed article about the ethnic cleansing that has been taking place under Nato supervision here. Apartheid didn’t work in South Africa, where its detractors sometimes referred to it as “balkanisation“. And now it has been re-exported to Europe, where the voices calling for the Bantustanisation of the Balkans are growing louder. There has been very little publicity in the Western media about the International Court of Juctice’s ruling that Serbia was not responsible for many of the war crimes that the Western media had accused, tried and convicted it of. Here is one of the exceptions. The Western Confucian asks whether Mr Clinton will soon be shipped off to the Hague to face trial. Or Messrs Blair and Bush, for that matter. There are also interesting comments here and here. Nobody came out of the wars of the Yugoslav succession smelling of roses. Horrible atrocities were commited on all sides. But the attempts of Western politicans and the Western media to demonify the Serbs and lay all the blame on them must rank as one of the more disreputable spin attempts of the 20th century. The breakup of Yugoslavia began in 1991 when Slovenia and Croatia moved toward independence and pleaded with Western European powers for support. The response of the West was defined by Germany, and the response of Germany was in large part defined by the Catholic connection. The Bonn government came under pressure to act from the German Catholic hierarchy, its coalition partner the Christian Social Union Party in Bavaria, and the Frankfurter Allgemeine Zeitung and other media. The Bavarian media, in particular, played a crucial role in developing German public sentiment for recognition. ‘Bavarian TV’, Flora Lewis noted, ‘much weighed upon by the very conservative Bavarian government and the strong, assertive Bavarian Catholic Church which had close connections with the church in Croatia, provided the television reports for all of Germany when the war [with the Serbs] began in earnest. The coverage was very one-sided’… Germany pressured the European Union to recognise the independence of Slovenia and Croatia, and then, having secured that, pushed forward on its own to recognize them before the Union did in December 1991. Austria and Italy promptly moved to recognize the two new states (1991) Slovenia and Croatia, after German recognition and pressure, and very quickly other Western countries, including the United States, followed. The Vatican also played a central role. The Pope declared Croatia to be the “rampart of Christianity,” and rushed to extend diplomatic recognition to the two states before the European Union did. The Vatican thus became a partisan in the conflict, which had its consequences in 1994 when the Pope planned visits to the three republics. Opposition by the Serbian Orthodox Church prevented his going to Belgrade, and Serb unwillingness to guarantee his security led to the cancellation of his visit to Sarajevo. He did go to Zagreb, however, where he honoured Cardinal Alojzieje Stepinac, who was asociated with the fascist Croatian regime in World War II that persecuted and slaughtered Serbs, Gypsies and Jews (Huntington 1998:282). The EU has just sent a high level delegation to Serbia to ‘press’ the Serbian government to take part ‘positively’ regarding UN talks on the future of Kosovo. I dont take kindly to the United Nations meddling into the internal affairs of my country, but I take even less kindly to the EU poking its nose in. We’re not even part of the EU. Who do these arrogant bastards think they are. Does Serbia send special envoys to tell Spain to allow the Basques to have independance. Do we threaten them with withdrawal of an assortment of economic goodies if they dont play ball. At a time when all kinds of people, including the Orthodox Peace Fellowship, are trying to dissuade the US government from invading Iran, it is as well to remember that the other US political party was in power when Kosovo was invaded, and the problem is no nearer to solution than it was before the invasion. All that NATO (the North Atlantic Terrorist Organisation) succeeded in doing was exacerbating hatred, and making peace unattainable. When the Butcher of Belgrade left the White House, the Butcher of Baghdad moved in. I’m not sure that he’s crazy enough to want to invade Iran as well, but perhaps he wants to add the Terror of Tehran to his epithets. But none of these invasions has solved anything. But perhaps Serbia should bomb Madrid until the Basques are given their freedom. After all, everyone else is doing it.